Beating Exercise Addiction & Overtraining for a New "Personal Best"
Old habits don’t have to die hard! As you age, evolving your exercise habits to keep in tune with your body's changing requirements is vital for optimal health. Being fit and healthy doesn’t always have to mean slogging it out at the gym or running endless miles. As we go through life our body’s requirements and physiology alter. Therefore, you shouldn’t be afraid to shake up your exercise routines a little to support this. Forcing your body to keep up with its 20 or 30 year old self can be punishing and could in time have massive negative consequences to your overall health. I’ve exercised for as long as I can remember…literally! One of my first memories is running around our local park behind my dad, trying to get a PB (personal best) which resulted in an ice cream on the way home. As a competitive swimmer I trained before and after school, 4 hours daily. Falling asleep in lessons and stinking of chlorine was pretty normal to me. This escalated to triathlons, marathons and then I made exercise my career. No escape! I’m not complaining though- I adore exercise! I love the energy and buzz it gives me, the way it clears my mind, keeps me focused and basically makes me feel alive. At that stage of my life I was constantly pumped high on endorphins and always wanting a new challenge. I was addicted to exercise and felt sluggish and awful if I had a few days off. This was all fine for a time. I was young and my body could keep up. I was in my late 20’s and nothing could stop me! However, as I got older, gradually this heavy exercise regime started to take its toll on my body. My muscles constantly ached, and I remember being terribly moody at times as I was so, so tired, my sleep was awful and I constantly experienced bouts of insomnia. I was doing so much exercise that it was difficult to maintain enough nutrition to support it. I wasn’t eating enough to fuel my habit and so my weight and body fat dropped to unhealthy levels. Without knowing it, I was jeopardizing the one thing I’ve always thought my fit and healthy body would provide me with…my fertility. I was diagnosed with Exercise Induced Amenorrhea. This basically means my periods stopped and I was no longer ovulating. With excessive exercise and not enough nutrition to support it, my reproductive system was left with no energy to function properly. It went into a dormant state and stopped producing oestrogen, which is the hormone required for ovulation. Without oestrogen being produced, I had little chance of conceiving. I’ve always prided myself on being healthy. I’m never sick, I eat a good "clean" diet and exercise regularly. But, can being "too healthy" or exercising too much at certain points of our lives can be detrimental? That's the question I've had to answer for myself and my future. Since this diagnosis, I’ve had to work on turning my life around, changing up my diet and exercise routines and listening to what my body needs on a daily basis. I’ve had to learn to relax more. My adrenal glands have been worn down by the constant secretions of adrenaline! I’ve had to reset my goals and mindset. I desperately want children and so I need to give my body a rest and provide my reproductive system with the energy it requires to function again as normal. This means throwing out the long distance runs, the high intensity sprints and everything I’ve focused on for so long as those endorphins were causing me exhaustion. In some respects this transition has been really difficult. It involves changing a lifetime of exercise habits which I’ve more than enjoyed. Running along the river as the sun rises I would honestly say is one of my favorite moments! But, by focusing on what I really want from life right now, I have managed to change my exercise habits to benefit myself in my present moment. Instead of running endless miles to exhaustion, I now practice yoga 2-3 times a week, and I’ve found that I actually love it! My body doesn’t ache all over anymore which is a strange yet amazing feeling and it really helps calm my mind too. I use bodyweight and light resistance work to maintain my overall body strength and place particular focus on my core muscles. Strengthening the core muscles, particularly the muscles of the inner core unit, is so important at this stage of my life as I am hoping to conceive. The more work I do now to strengthen these muscles, the less chance I will suffer from Diastasis Recti (should I be lucky enough to fall pregnant). It will also help my abdominals recover far quicker postpartum and reduces my chances of suffering from lower back pain or pelvic floor dysfunction. These chronic conditions are widespread yet often overlooked consequences of Diastasis Recti in new mums. As a Pre- and Post-natal Exercise Specialist with Tangram Wellness, I’m helping prenatal, postnatal and women on the fertility journey become more aware of the importance of specific core strengthening techniques which must be included in their present exercise routines. I see so many new mums who have snapped back into old exercise habits too fast, in a bid to lose their baby weight. This usually results in a protruding mummy pooch, a weak and very sore lower back and quite often, stress incontinence. This doesn’t have to be the case- don’t be scared to change your old exercise habits! It's so easy to get addicted to endless exercise, push your body too much and never change up your routine. I’m urging you though to get more in tune with your body. Are you training with focus or simply pushing yourself to exhaustion each time? Overtraining is a common yet unnecessary problem. Take time to make sure that you recognize its signs and adjust your exercise accordingly before it effects your physical and emotional health. It's been really challenging for me not to go running as it’s my passion, but I’ve realized it’s a worthy sacrifice. I’m so glad I’ve finally listened to my body and recognized my symptoms of overtraining and exhaustion. I’m optimistic that my body will thank me for making these changes soon. Are you also on a fertility journey, and wondering how exercise fits into the equation? Have you ever ventured into the waters of overtraining or exercise addiction, and if so, how did you make the shift? Do you have questions on overtraining? Leave your thoughts in the comments section- we always love to hear from you. Anna Kwan runs several post-natal classes a week, and will be launching a pre-natal class soon. She also works with mothers one-on-one. 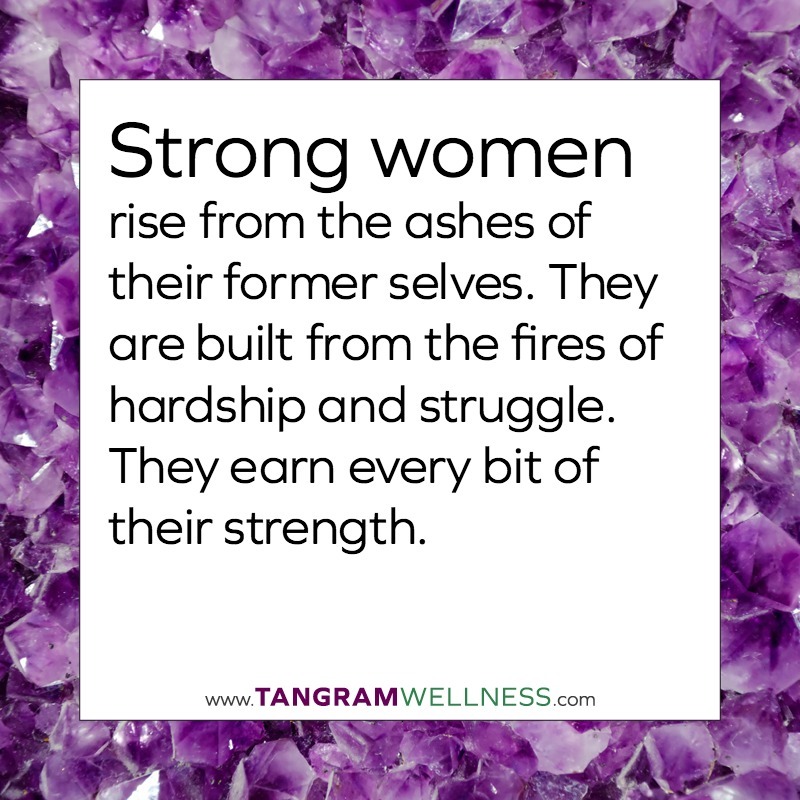 Email her at anna@tangramwellness.com for a consultation or to book in. Q&A With Tangram's New Metabolic Personal Trainer & Mat Pilates Instructor, Yan Huang! As Tangram expands, demand for our women-focused integrative fitness offerings have quickly increased over the past year, and we're happy to welcome Yuyan (Yan) Huang on board! Yan will be serving as a metabolic personal trainer and mat pilates instructor, providing tailored fitness services to women across central Singapore. Yan's answered a few questions to help you get to know her better. You've been involved in the fitness & wellness world for 8 years now. What changes have you seen in Singapore? What's one thing that works…. and one thing that doesn't? Over the last 8 years in the world of fitness and wellness, I have noticed how people are definitely starting to value the importance of a healthy and active lifestyle as a way of balancing the high strung and stressful life in Singapore. There is also a lot of conflicting information out there regarding what's healthy or not, and what's the best method to lose weight/get stronger/lose bodyfat. Many people are confused! I've noticed a rise in injuries as a result of sudden engagement in various fitness activities that people just aren't ready for, and also how people's health changes with the current quality of their life, food and sleep. The one thing that works will be what works for YOU as an individual which is in line with your goals, not the goals of others! The one thing that doesn't work... If I have to say what doesn't work, it would be sticking to one modality of training without looking at your lifestyle and physical, emotional and mental self as a whole. You focus on the relationship between nutrition, exercise and hormones. Why the emphasis on hormones? I love this question! This revelation of looking at your fitness or health goals from the hormonal point of view came at a turning point in my life right after my fitness competition in 2011. Like most people, I started out thinking that to lose weight or fat, it's all just about caloric deficit and exercising more. I did that and lost the weight, but I did not gain the strength nor manage to lose the typical female "trouble spot" areas. I'm a person who has always wanted to get to the root of the problem and seek a solution. So, that's when I got into bodybuilding- to learn how the competitors get so lean. I did get lean for sure however, no one in Singapore talks about life after competition openly or how to maintain the lifestyle and leanness. That is when I found out about the impact our hormones have on the human body through Dr. Jade Teta and Jill Coleman at the Metabolic Effect. It opened my mind to how we have been misled for many years thinking that weight loss is equivalent to fat loss. From this viewpoint, I noticed the relationship between hormones and weight when I was teaching youths- how their stressful lifestyle was causing them to weight gain around the midsection. Meanwhile, my female friends and family were talking about their fat gain around their midsection, arms, mid-back and thighs. If stress levels and hormones aren't in balance, our bodies will tell that story. What's the biggest challenge you've overcome and how did you do so? Learning to embrace the big failures - having to close my horology showroom in 2013. The shop was a culmination of almost 8 years of my heart and energy. Like many entrepreneurs, lots of sacrifices were put into the business. Having to make the decision to let go and close the company was a huge challenge for me. How I overcame it: through lots of reading, meditation, and the power of mind -- realizing that no success in life comes without falling -- because it is through the bitter moments and the challenges that we grow and develop to be best version we can be. And, once you see the bigger picture and break through it, you will be so grateful that you did. There is always something better ahead. That's how I followed my heart and entered the health and wellness industry as a professional. Favorite exercise - and why! Romanian deadlift! It's a compound technical exercise that works both the physiological and neurological aspects; the bigger muscles and smaller stabilizing muscles groups and breathing are all utilized. It also exposes the areas where we may be weaker, such as the inner TVA unit, the muscles around the shoulder blades, the mobility and strength of our wrists and fingers, right down to our ankles and feet. It is very empowering and yet metabolic boosting exercise when performed well, and it's effective in developing the hamstring and glutes and works the posterior chain, which helps with posture. Tell us about your approach to fitness. How I look at fitness has definitely evolved from when I first started. My approach to fitness is now targeted more from the lifestyle point of view. Aiming at long-term sustainability towards maintaining strength, grace and a healthy body fat percentage. By lifestyle, I mean looking at the physical, emotional, spiritual and mental aspects, delving deep within into the why and the purpose of why people do what they do, why they eat what they eat. You have some experience on the bodybuilding stage. What did you learn from that experience? One major takeaway I learned is this -- the mind is a very powerful gift we all have been blessed with. Anything is possible if you truly put your heart, body, mind and soul into it. I say this because in my lifetime, I would never have thought of myself wearing a two-piece bikini and walking on stage. I was never that kind of girl so this was definitely a mental breakthrough. All I had in mind that day was -- I wanted to debunk the myth that weightlifting causes bulk in ladies and more importantly it is possible to get really lean through pure nutrition and training. But I also learned that most people just want to know what works for them to get healthier, leaner, stronger and feel really good and confident about who they are. They don't necessarily want to be standing on stage. I love anything that is packed with natural wellness and colours without excess additives, salt and sugar. But an all-time favourite, surprisingly is a good ol' simple baked Portobello mushrooms with melted cheese, salmon with fresh herbs and sweet Japanese potatoes. If you could give one piece of advice to a client that's been on the yo-yo diet rollercoaster, what would that be? Ditch the "eat less, exercise more" model. It is not sustainable, and more importantly, it wrecks your entire hormonal system which makes you gain more weight and fat. It makes maintaining one's weight or losing fat a lot harder later on! Treat your hormones right, love your body entirely, and she will love you back in return. It will show, without a doubt. As always, thanks for reading! To learn more about Yan's background, experience and qualifications, visit her profile here. book personal training or pilates sessions with Yan, contact us via email or call + 65 9725-0583. Have a question on hormones and fat loss for Yan? Leave it in the comments section! Friends in Singapore, I'll be leading a Body Image workshop with Primetime next Tuesday evening. It's a fantastic opportunity to learn, network, get to know yourself a bit better, begin improving your body image, and perhaps assist your daughters in doing the same. If you can make it, please join! 1. RETHINK COMPLIMENTS. Instead of complimenting someone on their physical appearance like we always do, acknowledge a positive attribute that's beyond skin deep. Like, "hey Adrienne, you're a truly awesome extrovert because you respect all sides of the coin," or "Roz, the weight room is a hundred times more sparkly and motivating when you're in it" or "Katheryn, if anyone ever teaches me how to do one of those wild & zany yoga headstands it's going to have to be you." Get it? 2. GET SPORTY. Studies suggest that girls and women involved in sports, as well as exercisers generally, have more favorable body image then those who are largely sedentary. So, get active and find out what your body is actually capable of. 3. MAKE A PACT AGAINST SELF-DEPRECATION. I know it's an easy way to bond and for many, it's also a habit, but your body really does hear what you're saying about yourself and it responds accordingly. Seriously. 4. SPIRITUAL PRACTICE- GET INTO IT. Be it yoga, journalling, prayer, meditation, daily gratitude lists, communal worship, or getting up with the sunrise to contemplate life in solitude, learning how to base your life on wisdom, inner guidance and the larger picture will pull you further away from the stuff that doesn't really matter at the end of the day, whether that's zits, a roll of fat, wrinkles or anything else. 5. LIMIT YOUR TIME ON SOCIAL MEDIA. I know- it's sort of ironic for me to post this on the blog- but the longer we spend on social media, the worse we tend to feel about our bodies and ourselves as a whole. Free yourself from the constant comparison trap that social media tends to encourage by being pointed and specific about your social media use. Ok, I've got MUCH, MUCH more for you next Tuesday so hope to see you there but if not, perhaps this short list might be of use or make you smile. If you think someone might benefit from this workshop or list, please share.